Academic study of social activism and social movements has become increasingly prevalent over the years; this is due in large part to the fact that activists have captured public imagination and gained substantial influence in political discourse. For instance, Occupy Wall Street activists, Tea Party activists, and activists affiliated with the Arab Spring have transformed political debates and have become the focus of mainstream news media coverage about a variety of different political topics. Journey into Social Activism explicates the philosophical foundations of the study of activism and illustrates four different research sites in which activism can be observed and studied: organizations, networks, events, and alternative media. The book will introduce students and scholars to important qualitative approaches to the study of social activism within these four research sites, which is based entirely on successful research projects that have been conducted and published in recent years. 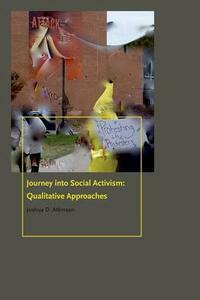 Ultimately, this book will prove integral to any students and scholars who wish to use qualitative methods for their research endeavors concerning social activism in contemporary society.